What’s the first instrument that pops into your head when you think of Hawaii? You probably think of the humble ukulele thanks to the song “Somewhere Over the Rainbow.” Although the song was originally recorded for The Wizard of Oz, Hawaiian ukulele player Israel Kamakawiwo’ole released his cover that has earned over 500 million views on YouTube. There’s a reason why it’s nearly impossible to find someone who hasn’t heard his song. His beautiful voice complemented by the simplicity of his melodies touches everyone. You may not think of the ukulele as glamorous, but this tiny instrument has wormed its way into the hearts of millions of people. If you’ve always wanted to learn how to play an instrument but felt too intimidated, the ukulele can be your perfect match. Besides being undeniably charming, the ukulele has so much more to offer. 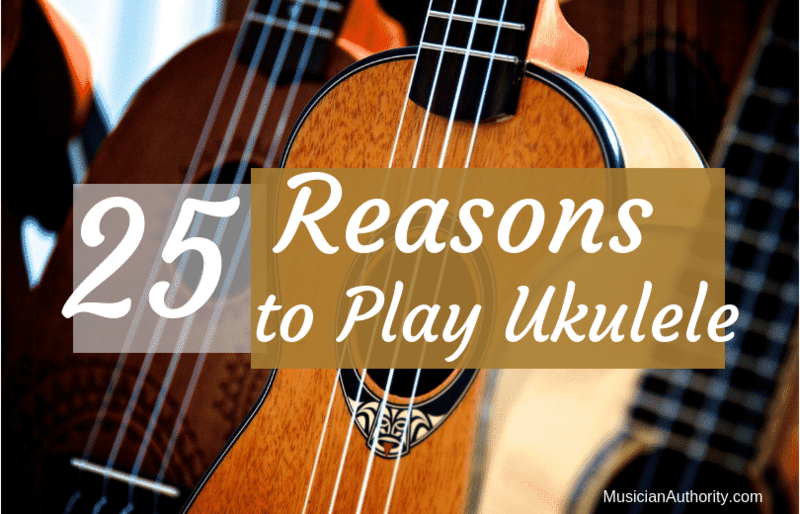 In this article we’ll go over 25 reasons why I think everyone should play the ukulele. I really believe the ukulele to be an instrument for everyone. And this would be regardless of age or whether or not you are musically inclined. So you could totally be 3 years old or 83 years old with or without musical knowledge or experience – and you’d still be a great candidate for the ukulele. As I’ve stated before on my blog, If you want to learn how to play an instrument, the easiest one to get started with is the ukulele. There are so many types of instruments you can choose from, but there is something about the ukulele that makes it unique for those that want to start playing their first instrument. Even if its your second or third, it’s quite a cool instrument to pick up. It has become common, for example, for guitar players to pick up the uke. Many of them get so caught up with the ukulele that they end up spending more time playing it over their other instruments. Here are 25 reasons why you should learn to play the ukulele. This is huge! I mean, I know the feeling of being intimidated or overwhelmed with music lessons. So the learning curve is something to consider. The easier you can learn an instrument – the better, and the faster you can start actually playing it – is even better! I’ve learned most types of musical genres and styles with a variety of different instruments. As I’ve probably mentioned before – some of the instruments I learned to play are piano, saxophone, accordion, guitar, bass, and some percussion. After years of playing music I can say that none are as beginner-friendly as the ukulele. I think it’s worth repeating that. The ukulele is probably the best instrument for beginners to play. With 3 simple chords you can play hundreds of ukulele tunes. You can do this on other instruments as well. I would say that the simplicity is more unique to the ukulele because not only is it really small, but it only has four strings. So in my opinion for the purpose of learning, getting aquainted with music and learning sounds by ear I would go for the ukulele hands down. The four strings and smaller fretboard means it’s easier to learn, less intimidating, and you’ll have more time to play fun tunes. And since your limited to fewer strings and to the smaller fretboard, you will be more versatile when you try other instruments. This is only reason number one folks! Ready for number two? 2. It’s Incredibly Fun To Play. His advice is simple yet it’s the reason he became who he is today. His biography on the NBA website states that Michael Jordan is the greatest basketball player of all time. He has truly marked a legacy that will never be forgotten… all because, well, he had a lot of fun playing basketball. So having fun is a big factor in learning and being consistent with practice. There’s really nothing like having fun playing an instrument. That should be one of the reasons why you play it in the first place! Just ask my buddy Brett McQueen who grew up playing piano and guitar. Once he picked up the ukulele, he had so much fun he couldn’t put it down… and then his website Ukulele Tricks was born. The ukulele is naturally fun. The sounds you strum will captivate you and others that are listening. I mean, watch and listen to the Gardiner Sisters having fun with a cover song. It makes me want to stop typing and start playing! So after watching this video, think about the question below and how it may benefit you. is the ukulele worth learning? The ukulele is worth learning because of its many benefits, such as social engagements. It’s an enjoyable instrument that is often used to share a good time with others such as family gatherings, ukulele groups, and live performances. The distinct sound of the ukulele makes it a popular choice for learning popular songs such as “Somewhere Over The Rainbow” and “I’m Yours”. The most popular type of ukulele is the soprano which is only 21 inches long. So handling a ukulele would be significantly easier than handling larger instruments. Using the guitar as an example again, you’ll be working with 6 strings and if we’re talking acoustic guitar then that’s 5 times the body size of a ukulele. The advantage it has of being smaller in size and fewer strings makes it easier for people of all ages to play. This brings back some nice memories because its the reason I got into the ukulele in the first place. My daughter Abigail turned 3 years old recently. You can guess which instrument suited her really well. Later on she will be able to easily handle larger instruments like drums, electric guitar, bass, etc. Speaking of children. It gets me really happy to see kids all the way to seniors playing the ukulele. There are quite a few really young ukulele players that post videos on youtube. Take a look at this one which is a ukulele cover by a 7 year old named Gail Sophicha playing the ukulele really well! If a 3 year old can handle the uke, you can handle the uke. Tell me that you can’t play ukulele after watching this video… you know you can do it. DO IT, DO IT!!! How about an 83 year old playing the ukulele? Yes, that is Warren Buffett the most successful investor of the 20th century. He loves playing the uke for fun and does an amazing job as well. So if he can play the ukulele, why would you think you can’t? Check him out playing ukulele and be inspired to learn and have fun. Yeah, he’s totally a great reason why you should pick up the ukulele if you haven’t already. It’s no wonder that the ukulele is such a beloved instrument. The sounds it creates invites a happy and feel good vibe that relaxes you and makes you forget about the troubles and pressures of life. This may sound a bit cliche but its the truth. When I get home from a long day, I get refreshed with just a couple of minutes playing. This is why even celebrities enjoy playing the ukulele. If you’ve seen the movie Journey 2: The Mysterious Island, than you probably noticed Dwayne “The Rock” Johnson sporting a nice ukulele and playing the great classic What A Wonderful World. Interestingly enough, it wasn’t just an act for the movie. He really does know how to play the ukulele! Okay – I don’t know exactly to what extent he plays. But I would venture to guess he probably does in his leisure time. President Obama goes to Hawaii often with his family so he’s gotten as close to the heart of the ukulele as can be. It’s inspiring to see not only the President but celebrities as well and people from all walks of life playing the ukulele. The following pictures shows John Lennon, Dwayne Johnson, Bill Cosby, Elvis Presley, Taylor Swift, James Franco, President Barack Obama, and Ryan Gosling. Some of them in these pictures actually played the ukulele often in their career, especially Taylor Swift. Whether you want to learn the ukulele to become a star or just want to learn for a fun learning experience, the ukulele is for everyone. Life is serious. Life is also very tough. Maybe your having a horrible day at work, or stressed out about the bills and other stuff you’ve got to take care of. Worry not my friend… I dare you to whip out the ukulele and play “What A Wonderful World”. I guarantee that this will change your perspective and shift your focus to the goodness around you. While you’re at it, your stress will run away from you because, uh yeah, it’s that scared of the ukulele. Seriously. It also helps to make funny faces when nobody is looking. You can buy the best ukulele for beginners at a very decent price. Prices range from $30 to about $100 for a beginner ukulele. The most popular to buy go for about $50 for this Kala or about $80 for this Lanikai . But the key here is that starter ukuleles for beginners are very economical. When I was looking to get my first saxophone, guess what, I found out that the Yamaha student model for the alto saxophone costs around $1,500. To get a decent piano or guitar you would have to shell out a couple of hundred bucks for a Yamaha or Fender. So starting on the uke is that much easier. My first ukulele was a Kala for only about $50 and I’ve learned a TON on this ukulele just having fun and learning different techniques. 10. Very Portable – You can take it anywhere! If you ever travel with a ukulele, you’ll be able to take it as your carry-on. I’ve heard horror stories of musicians who go on tour and leave their instruments with other fully loaded luggage being transferred at the airport. Those instruments sometimes come back damaged or missing altogether. So you can play it safe by carrying it with you. Isn’t that cool? 11. Did I mention Ukuleles Are Affordable? You’re probably asking yourself, “Should I buy a ukulele?”The answer is definitely yes! Unless you plan on starting a professional band that tours around the world, you don’t need to break the bank when you buy a new ukulele. Depending on how much money you’re willing to spend, you can get a great ukulele for around $50. Be aware that there are super cheap ukuleles out there for $20, but you get what you pay for. The best thing to do is search for reliable sellers who have good reviews and fair prices. Other instruments usually cost hundreds or even thousands of dollars. It doesn’t make sense to pay that much money when you’re trying something new. What happens if you don’t like the instrument or you only want something to play casually as a hobby? If you do decide to get more serious about your ukulele playing, you can always upgrade while still paying a reasonable amount. With all of the information and tutorials online, learning to play the ukulele has never been easier. You don’t need to spend countless hours trying to decipher sheet music. There are plenty of videos that demonstrate how to play certain chords, tabs, or offer other helpful tips. If you’re a visual learner, then watching someone else play can be helpful. If you need to read something, then learning how to decipher tabs is a painless process. No matter what your learning style is, the ukulele will be easy to master. You could even pick one up and start strumming randomly. It would still sound good. Did you know that ukuleles come in different sizes? Although any ukulele will be small, ones that are only a couple inches longer can sound completely different. Common sizes you’ll be able to find include soprano, concert, tenor, and baritone. If you want to sing along with your ukulele, you can find one that perfectly matches your vocal range. Ukuleles are so small that they can fit in any personal bag you carry. This means that you can enjoy the sweet sounds of your ukulele anywhere. There was actually a student at my high school who used to roam the halls between classes playing the ukulele. Even if people didn’t personally know him, everyone knew him. Everyone loved The Ukulele Man. The only other instruments that could rival the ukulele in size are perhaps the triangle or maracas, but let’s be real. Can you find any instrument as versatile as the awesome ukulele? The skills you pick up learning how to play the ukulele can be helpful in your regular life, too! In the modern world, everyone needs to know how to type fast. Increasing your finger strength and dexterity with the ukulele can benefit many other aspects of your life. If you want to get better at using both hands equally, playing the ukulele is a fun way to become ambidextrous. The Ukulele Man can attest to how popular playing the ukulele can make a person! Even if you’re an introvert, having a ukulele on hand can act as a wonderful security blanket. If you want people to think you’re cool but you’re not the best at socializing, just whip out your ukulele and start playing. The ambiance that ukuleles create is welcome at almost any social gathering. You’ll be everyone’s hero if you bring a ukulele to a bonfire, beach trip, or any other casual event. The guy who always lugs around his massive guitar looks like he’s trying too hard to show off. Unveiling your little ukulele is like unwrapping a present that everyone gets to enjoy. Did you know that most songs can be played with only 3 chords on the ukulele? You’ll be amazed by how much unique music you can play be varying 3 chords. The best news is that even the most inexperienced musicians can master these chords in an hour. This means that you could trick people into thinking you’re a pro the same day you start learning how to play the ukulele. If you ever suffer from boredom, stress, anxiety, or depression, then the ukulele can be your best friend. Everyone feels bad at some point, and having a healthy coping mechanism can help you get through any tough times. Music has restorative properties. There are innumerable studies out there that show how magical music is for people’s physical, emotional, and mental wellbeing. Although the “tortured artist” has become a cliche, almost every person who plays or listens to music will experience an increase in their mood. In the above study, participants who were allowed to play instruments during a therapy session showed fewer signs of anxiety and depression than participants who went to counseling. There is a paradox in the way we treat mental health. Most people who suffer from anxiety and other issues are too nervous to seek the professional help that would alleviate their symptoms. Not to mention, therapy can cost an arm and a leg. Once you buy your inexpensive ukulele, each therapy session is free. Playing the ukulele can help take your mind off of bad things, release built-up tension, and let you express your emotions in a judgment-free way. If you buy a ukulele, chances are that you can make it last a lifetime. Even the cheapest ukuleles are built sturdily. Their small size may make them easier to drop, but you never have to worry about breaking them. While this doesn’t mean your ukulele is indestructible, you’d have to actually try to break it. You can always smash your ukulele after an impressive performance, but it probably won’t look as dramatic as smashing a guitar. Besides, why ruin the awesome vibe your tunes created? The only thing you may need to replace is the strings. Sometimes they may be cheap and snap easily or they can get worn with age. You could also snap a string while trying to tune your ukulele. Don’t worry, it happens to the best of us. Tuning your ukulele gets a lot easier with time. Until you learn how to tune your ukulele by ear, there are great resources that explain how to properly tune each kind of ukulele. You’ll be able to sound your best after a few quick adjustments. Again, let’s not forget The Ukulele Man. Although almost everyone has heard a ukulele at some point in their life, people rarely see someone playing one out in the real world. Other people may be more drawn to the ukulele’s more glamorous cousin, the guitar, because they want to be a rockstar. The problem is that so many people know how to play the guitar nowadays that it has almost become a cliche. Nobody has any negative associations with the ukulele because it is pure happiness in an adorable, tiny package. If you tried to walk around playing the bagpipes, you may get some nasty looks. No one will ever be offended by the sound of a ukulele. What’s even better is that you can make your cool ukulele look even cooler. Yes, it is possible. Ukulele accessories exist and they are the best way to customize your ukulele so it can best match your unique personality. Whether you’re the creative or analytical type, playing the ukulele can help you round out any skills you may be lacking. On the creative side, you can experiment with different playing styles and even try to write your own music. On the analytical side, you can master the finger positions and learn how to play all of the tabs. Musicians use both hemispheres of their brains more than normal people. Not only will playing music make you a happier person, but you can use any problem-solving skills you learn to improve your everyday life. By flexing both sides of your brain, you’ll be better at thinking outside of the box. It may not get you jacked, but playing the ukulele to exercise your brain is a lot more fun than going to the gym. The American Psychological Association backs the notion that music is medicine. If you have a bad day, don’t sit on the couch all day eating junk food. Though that may provide immediate comfort, it’s an unhealthy coping mechanism that makes you sicker and unhappier in the long run. Did you know that music can act like a painkiller? Many people will agree that music uplifts your spirits. As it turns out, music can also alleviate physical pain. Channel any nervous energy or anger into playing your heart out on the ukulele. After a good jam session, it’s hard to return to reality with the same perspective. Your problems that felt unconquerable may suddenly feel irrelevant. Although you only need to learn 3 chords to convince people that you know how to play, the ukulele can be as easy or difficult as you want. Once you learn all of the chords, you can try changing the tune. Learning how to play the ukulele in different tunes can give you more creative freedom to cover your favorite songs. Everyone can learn how to play an instrument, but people who develop a signature way of playing really stand out. When you learn how to play the ukulele, you can spend so much time playing songs that you would never think could sound good on the ukulele. Have you ever heard heavy metal played on the ukulele? It sounds incredible. Once you feel comfortable playing the ukulele, you can experiment with different strumming patterns, changing the tempo, and even adding in some beats by smacking the wood. If you ever need inspiration, there is a huge community of ukulele players online. Watching other people’s take on your favorite songs could inspire you to do some incredible things. Once people see how much fun you’re having playing your ukulele, they’ll be inspired to get their own. We can all agree that the world needs more happiness in it, and what better way is there to accomplish that than with music? If you know anyone who plays an instrument, you should suggest hanging out with them for a good old-fashioned jam session. Your ukulele can introduce you to a lot of wonderful people you would never have been able to meet otherwise. The feeling is mutual! Ukuleles aren’t normally at the top of people’s list when they think about which instrument they’d like to learn. However, once you take the time to really think about how cool ukuleles are, those are all you’ll want to play. Hopefully, this article has convinced you to give it a shot! At Musician Authority, helping others learn to play the ukulele is my passion. If you have any questions, I’d love to hear from you. why learn to play ukulele? The ukulele is a great instrument to learn because it is relatively easy to learn compared to instruments like piano or saxophone. There are many health benefits to playing the ukulele including improved focus and mental clarity, eye-hand coordination, social interactions, and more. The ukulele is a very beginner friendly instrument even if you have no experience playing an instrument. So these are 25 really good points as to why everyone should play ukulele. Get started on learning how to play the uke today with me to help you along the way.